LITTLE PIP is an illustrated Nursery Rhyme about a little kitten, which has just started getting to know the world around him. The world is big and there are so many secrets to discover, places to explore, and friends to meet. There are DANGERS as well, but mommy cat is always near to guide her precious and explain things around, unknown and mysterious. The story is followed by a Picture Dictionary and Where is…? INTERACTIVE activity pages. LITTLE PIP is a second book in EPISODE 1 of a new developing course for kids 0+ English All Around. The book uses and reuses 75 sight words that are close and comprehensible to a child because of the pictures, illustrating them, and the situations, familiar even to littlest ones. It is ideal for reading to your baby or toddler; for reading along with your young reader; and for reading your first English books if you’ve started learning English. Pip’s adventure series will lead your child from the basics of the language up to becoming a competent reader and a knowledgeable citizen of the world, who is ready to adjust to its challenges and changes. Pip, our cute and curious main hero, will never let your kid lose interest in reading books and exploring the world. 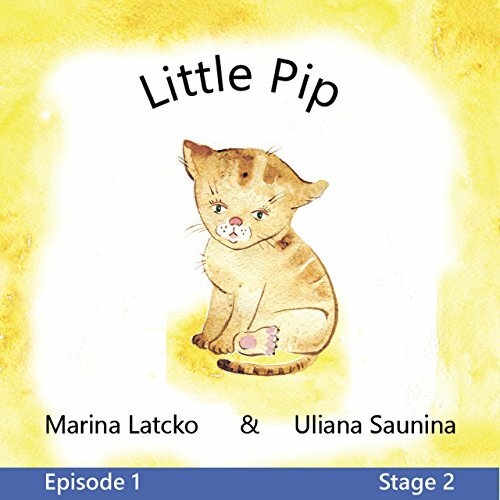 Each EPISODE of the course consists of 3-4 leveled storybooks about Pip, peeping at the same situation from different points of view and using varied structures and vocabulary to provide comprehension for kids and learners with any level of English. In addition to the engaging books, the course provides English-speaking and foreign language parents with a complex system of activities, stemming from Pip’s adventures and gradually building a sound knowledge of English together with developing their cognitive, physical, sensory, musical and social development. You won’t need to surf the internet in search of how to entertain your little one—everything is here; transcribed, audiotaped, and filmed. After implementation its English version, the Project will be translated into other languages: French All Around; German All Around; Italian All Around; Spanish All Around; Chinese All Around to name just a few.